The history of the Catholic Church in Southern Africa begins with the arrival of Bartholomew Diaz at Walvis Bay on 8th December 1487. He appropriately called it the gulf of Santa Maria de Conceicao. The first Mass, celebrated perhaps in late December 1487 or early January 1488, was celebrated on the island of the Holy Cross (named as such by Diaz), just off Port Elizabeth. 10 years later Vasco da Gama, on his way to India, would, on Christmas day, sight the land to which he gave the name “Tierra de Natal”. These explorers also brought missionaries with them, but the priests did not concentrate on evangelizing South Africa. Indeed, there is no evidence of any missionary work during these early days. 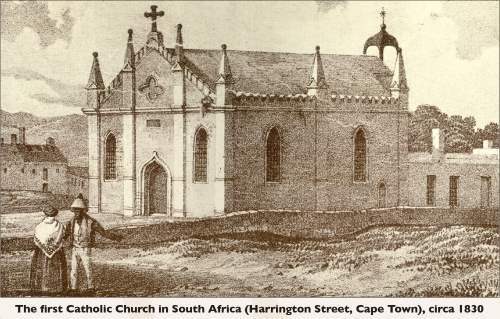 Between 1652 and 1795, under the Dutch East India Company rule, Catholicism was forbidden in South Africa. Only occasional visits of priests travelling on Portuguese or French boats were allowed. The same attitude prevailed between 1795 and 1802 under the British rule. In 1804, the Dutch government opted for religious toleration, but two years later, the British rule prohibited again the presence of priests and lost no time in expelling them. In 1818, Pope Pius VII appointed the Benedictine Dom Edward Bede Slater as the first Vicar Apostolic of the Cape. But he never set foot on South African soil as the Government in London forbade him to go there. He went to Mauritius where he was also the first Vicar Apostolic. Likewise his successor, Dom William Placid Morris also resided in Mauritius, never setting his foot on South African soil. In 1837, a new dawn came with the appointment of Bishop Raymond Griffith, a Dominican, as a third Vicar Apostolic of the Cape and first bishop of South Africa. The history of the Catholic Church as a visible institution began to take shape. In 1847, the Eastern Cape Vicariate was created. Father Aidan Devereux became its first Vicar Apostolic. It was him who invited the first religious sisters to South Africa. In 1852, the first missionaries of the newly-founded congregation of the Oblates of Mary Immaculate, arrived in South Africa. After many obstacles in establishing missions in South Africa, in 1861, Bishop Jean-Francois Allard travelled to the Kingdom of Lesotho. He obtained a mission from the King Moshoeshoe, the founder of the Basotho nation. This mission was to become one of the strongest Catholic communities in Africa. In South Africa very little had been done for the indigenous people. The first significant result came with the Trappists of Mariannhill in the 1880’s, under the leadership of Abbot Francis Pfanner. They developed innovative missionary methods, combining farming, schooling and preaching. These efforts eventually led to conversions, contributing to the growth of Catholicism in Natal. In 1925, the first South African born bishop, David O’Leary, was consecrated in Johannesburg. But the South African Church still relied heavily on expatriate clergy. It was only in 1948 that a national seminary (for whites) was founded. In 1951, when Pope Pius XII established the hierarchy in southern Africa, not more than five out of twenty one bishops were born locally. The first four African priests had been ordained at the turn of the century, but it was only in the 1920’s in the diocese of Mariannhill, that the first concerted efforts were made to train a black clergy. This led to the establishment of a national seminary for blacks in 1947. 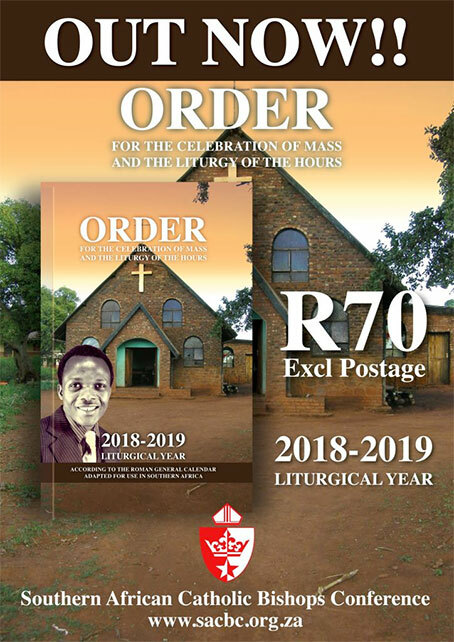 Despite its late coming on the missionary scene, the Southern African Catholic Church has shown remarkable signs of growth throughout the 20th century. 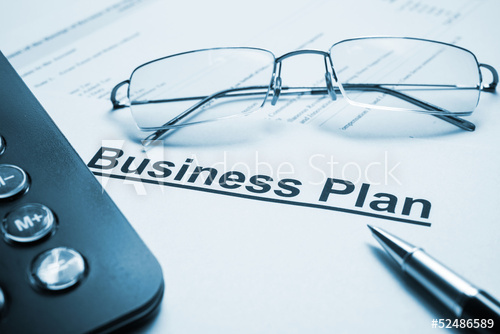 Long seen as a foreign church, it has now gained influence in all sectors of society. At least 8% of the South African population is Catholic, putting it up to the second biggest church in the country after the Dutch Reformed Church. About 80% of its members are black. Like most Christian Churches, the Catholic Church was relatively slow in opposing apartheid. 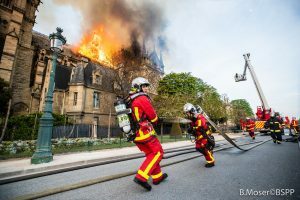 It labored at the cost of the heritage of segregation that it had shared with the rest of the Church in most pre-liberation colonial situations. During the first decades of Nationalist rule, the hierarchy often adopted a conciliatory stance towards the government in the hope of maintaining the Church’s network of schools, hospitals and welfare institutions. When in 1953 the government struck at church schools for African children with its Bantu education Act, the Catholic Church fought desperately to retain the educational system seen as its major aid to evangelization. The Southern African Catholic Bishops’ Conference, created in 1947, made its first pronouncement against racism in 1952 and in 1957, condemned apartheid as “intrinsically evil”. Until the late 1970’s however, there were few acts of defiance against the state. Within the Church itself, a de facto discrimination was practiced at many levels. In 1970’s, under the influence of the Vatican Council and spurred by protests from black clergy, catholic opposition to apartheid started to intensify. In 1972 a move began to desegregate the seminary. In 1976 the decision was taken with regard to both seminaries and schools. The Soweto uprising of 1976 led to a still greater awareness among Catholics for more active Catholic participation in various manifestations of Christian protest, activated mainly by the South African Council of Churches and the Christian Institute. Since February 1990, priority is given to conflict resolution, education to democracy and development. 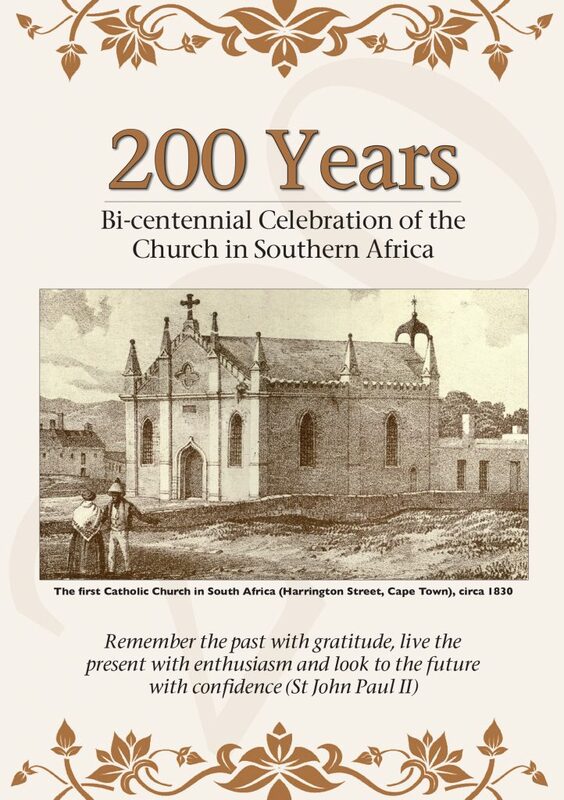 The year 2002 saw two Catholic anniversaries take place in South Africa: the 150th anniversary of the arrival of the Oblates of Mary Immaculate in Natal and the 50th anniversary of the proclamation of Our Lady of the Assumption as principal patron of South Africa. The year 2017 saw the Bicentenary Celebration of the Foundation of the Catholic Church in Southern Africa. 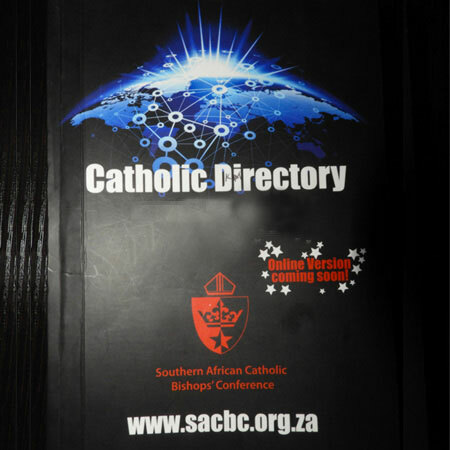 The official opening of this celebration was held in Cape Town where Southern Africa Catholic Bishops’ Conference Bishops gathered together in the Mother City to honor this special day. From the 25th June 2017, Southern Africa Catholic Bishops Conference (SACBC) set aside a period of a year, allowing all the faithful in the region an opportunity of celebrating the successes of the Catholic Church in Southern Africa. The celebration will officially come to an end on the 24th June 2018, whereby all the Bishops of the 29 SACBC dioceses, Priests and Religious will come together with the people of God to put officially to the end the 200 years celebration of the official foundation of the Catholic Church in Southern Africa.